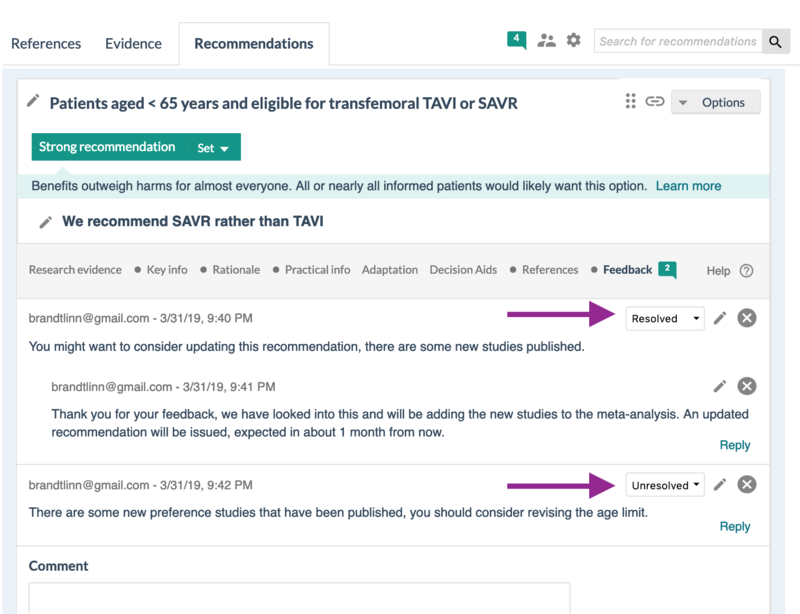 Authors can now better control the process of handling comments made in Recommendations, by setting status and seeing how many comments are unresolved. The default for new comments is 'Unresolved', and authors can change this to 'In progress' or 'Resolved' when processing the comments. 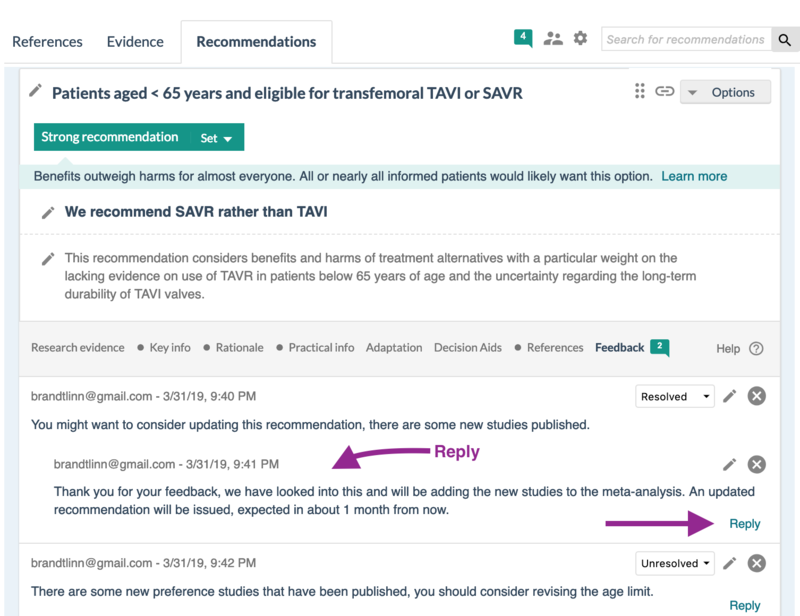 On the feedback tab of each recommendation authors see a total of the comments in that recommendation, with a visual marker (green flag) when there are unresolved comments present. On the top of the guideline, authors see the total number of unresolved comments in the whole guideline. Admins of a guideline, and the user that created the comment, gets an automatic email when a comment is made. The authors of a comment, and the author that changes the status, gets an automatic email when there is a status change. About comments: Comments can be internal, from internal/external review or public review. They show under the feedback tab in recommendations. Users must be logged in to make comments, so that the authors and admins can know their name, and we can send them automatic email updates. Admins can turn off the possibility of users to add comments in the guideline settings. Admins can delete and edit all comments, other users can delete and edit their own comments. You can now reply to comments in the recommendation feedback tab. Authors of a reply, and the author of the original comment, gets an automatic email when a reply is made. We have improved the publishing workflow. The list is now cleaner and it is easier to see which versions are public. 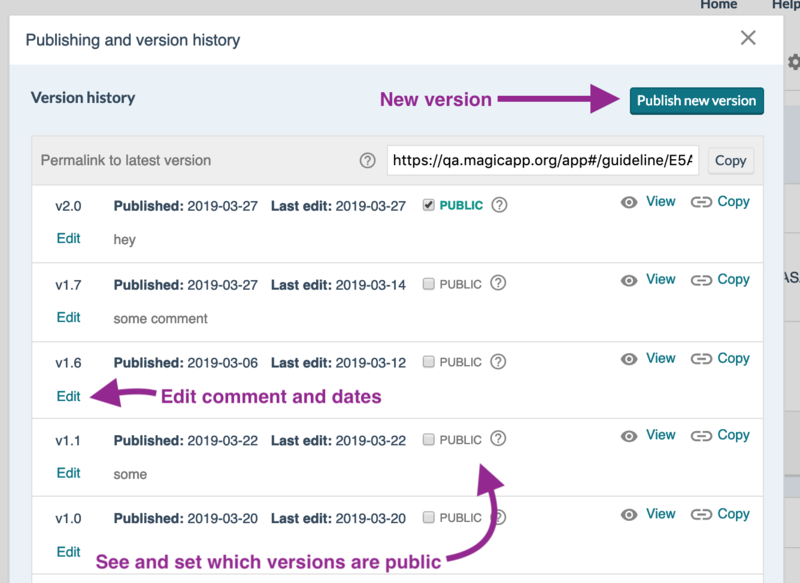 Admins can edit version comments and dates after the publishing, in case something was missed. Readers see only the public versions in the list. 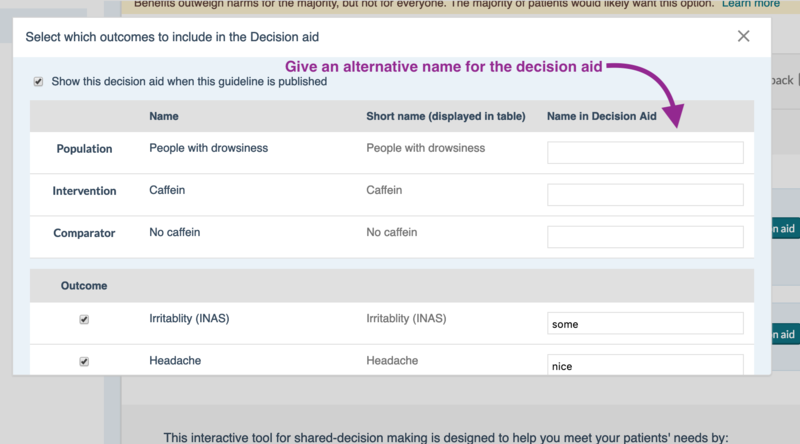 Currently you can set alternate names for the Outcomes in the Decision aids, to make them more user friendly. We now added the possibility to also create alternative names for Population, Intervention and Comparator. 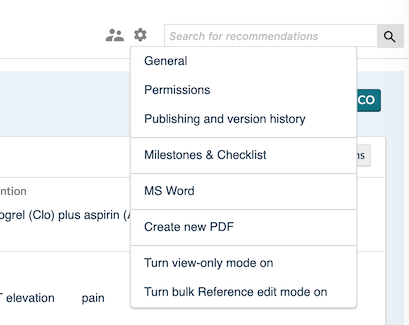 Up until now, authors and admins have had two top level menu items: a settings menu (with general settings, permissions, view -mode and reference bulk edit mode) and a listings menu (with Milestones, checklist, publishing, Word and PDF creation). These two menu lists have now been merged to make it easier to find what you are looking for. An overview of recommendation version history, with possibility to add update comments. Readers can only access comments of public versions. 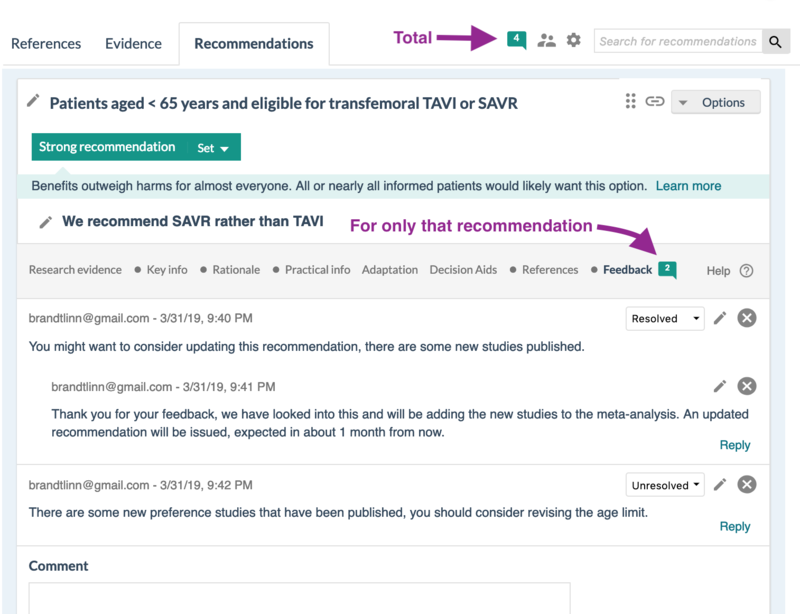 We have gotten feedback that our strategy of routing authors first to the Evidence window can be irritating, especially for authors who mainly are concerned with the Recommendation text editing, which are most of authors. Routing authors first to the Evidence window seemed to scare first-time authors with its complexity. All this have made us change the default window authors access, to the recommendation window. We welcome feedback if this have negative effect for your work. Adding Graphical SoF view also in PICOs for authors and PICO widgets. How to get information about new features in MAGICapp?